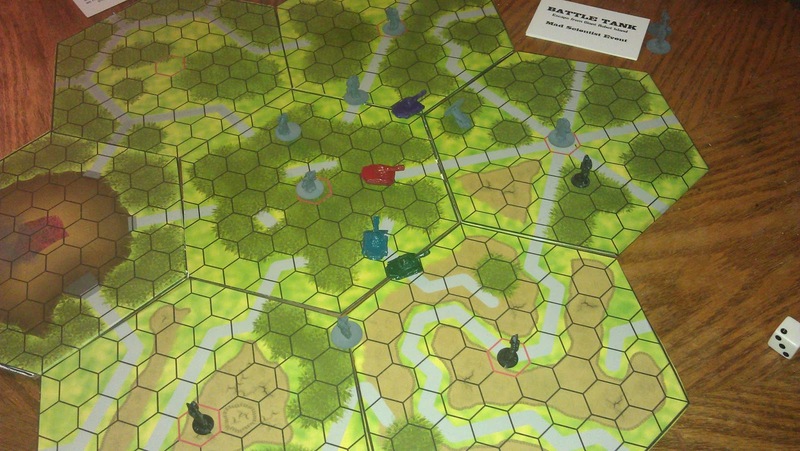 Inspired Press: Battle Tank Upgrade: Demo Prototype! Battle Tank Upgrade: Demo Prototype! Aside from minor tweaks, the tile artwork is done and updated with suggestions from you all. 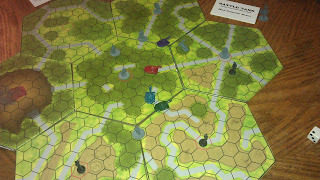 The tiles are now printed in full color and not in draft mode, as our first prototype was. You will notice the center hex on each tile is now colored red to help visually when you're playing robots (since new robots enter play from the center hex). Rather than being pasted onto corrugated cardboard we had lying around, our Demo Prototype is glued to hardboard (as of now our plans are for the salable products to be glued to chipboard). We are getting quotes for the price of a custom hexagonal die to make cutting these in bulk much easier and streamlined. You may also notice some colorful additions. Through trial and error, we have been experimenting with molding our own tokens and casting them in resin. They're not perfect yet, but with steady improvements as each batch is made we're getting a firm grasp on the process and will be able to produce as many of the little tanks and robots as we need. Next on the itinerary will be to make a MegaMech token, and then this thing will be fully playable. For those of you in the south shore of MA, we will be arranging a time to Demo this game at Battlegrounds in Abington, MA, so stay tuned for future announcements.